I haven't been feeling well since yesterday, so today's WIWW will simply feature my lovely rain boots by Tamara Henriques. I bought these and college, and they never fail to brighten a rainy (or sicky) day. I saw your whole outfit today. And you looked adorable as ALWAYS. Heart you. very cute boots. I need to buy a pair this year! rainy days are never easy-those are v fun though! I've been drooling over a pair of metallic Hunter wellies! Is it time to pull the trigger? Hmmmmmmmm. Love yours! 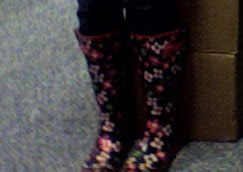 I want some rain boots too. Cute pair you have. WOW! This are solely FABULOUSLY CHEERFUL soles! p.s. I know it's silly but it's the silly things that make YOU feel better!! !